HYPERION ONE is Tekno System® series of compact infrared LED illuminators, designed to provide for anoptimal image quality with a relatively low energy consumption, even at the longest distances. The product is available in 3 versions, with a choice from 5 different lenses to meet virtually any installation requirements. The spotlight models (15°, 30°, 60°, 120° lens) are ideal for targeted object illumination, while those with elliptic beam (43x8°) are recommended for an effective and uniform illumination of wide areas. The aluminium structure of Hyperion One ensures high efficiency thermal yield and maximum LED durability, while the integrated power supply unit makes the installation extremely easy, with no need of an external junction box. One of the advantages of adopting this type of LED illuminator consists in being maintenance free. Hyperion One is supplied with a standard bracket for wall, ceiling or housing mount. 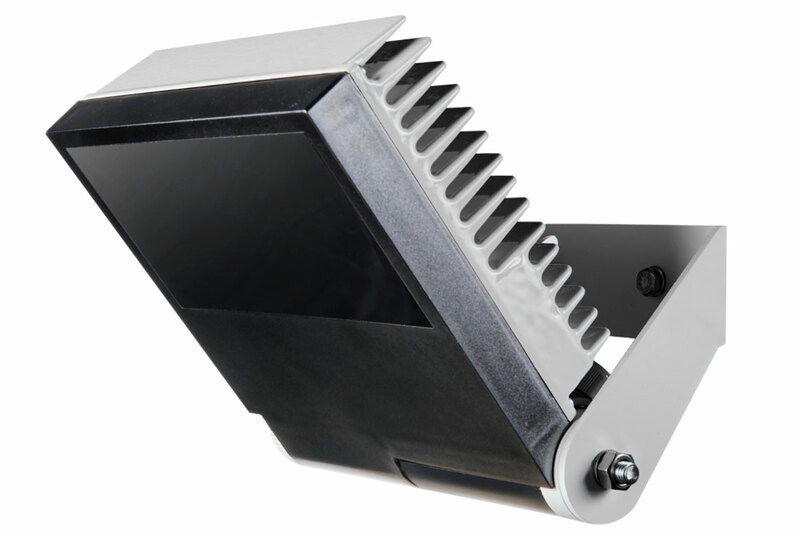 An additional bracket is available to adjust the illuminator both horizontally as well as vertically. Aluminium die-cast moulding and techno polymers construction. Available in three versions: small, medium and long with 5 different lenses (see datasheet for combinations available). Lenses: 15°, 30°, 60°, 120° (spot), 43x8° (elliptical). 115/230VAC, 24VUC or PoE input.